Advances in social movement research conceptualise micromobilisation as – at least – a two-step sequential process in which willingness to participate must first be generated and then translated into actual participation. However, such research often ignores a more fundamental first step in this process: the generation of movement support. I address this gap by drawing on a nationally representative sample of adults in the United States – who either sympathised with or opposed anti-immigration activism – to identify individual attributes differentiating anti-immigration movement supporters and non-supporters. Perceptions of economic threat, waning confidence in political leadership, and prejudicial cultural beliefs about Latinos represent attributes differentiated movement supporters from non-supporters. Power devaluation theory is used as an overarching framework to meaningfully interpret these results. More generally, I argue that grievances play an important, yet under theorised role in jumpstarting conservative micromobilisation and that principles from power devaluation theory can help us understand the differentiation of movement support, irrespective of a social movement's political orientation. 1.1 Over the past decade it has become difficult to ignore conservative activists mobilising in response to increasing levels of unauthorised immigration to the United States from Mexico, Central, and South America. Feeling the government is not adequately addressing the perceived crisis, citizens began taking border security into their own hands. These 'minutemen', as they have come to be known, are most recognised for their presence along the U.S.–Mexico border where they look for unauthorised migrants crossing through desert areas to report to border patrol and, in some cases, attempt apprehension themselves. By joining leading anti-immigration organisations, such as the Minuteman Project (MMP) and the Minuteman Civil Defense Corps (MCDC), citizens were increasingly mobilising against immigration between 2005 and 2010. 1.2 Scholars have long been interested in how and why individuals mobilise in such activism. As to the how of micromobilisation, attention has been placed on the general steps through which individuals pass as they are incorporated into movements and become full-fledged participants. In this regard, micromobilisation has recently been conceptualised as a sequential process involving at least two distinct steps. These include, first, becoming willing to participate and, second, actually participating (Beyerlein & Hipp 2006; Klandermans 1997; Klandermans & Oegema 1987; Oegema & Klandermans 1994). As to the why of micromobilisation, researchers identify attributes differentiating the willing from the unwilling and, among the willing, attributes differentiating participants from non-participants (Munson 2008). 1.3 Despite recent theoretical advancements, there remains a discernable gap. 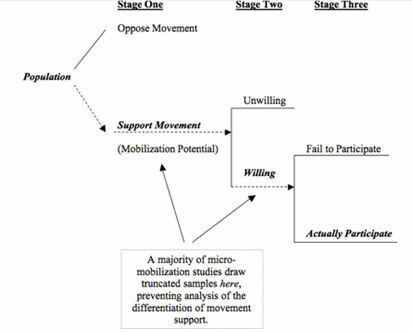 Because much of the empirical research on micromobilisation treats the phenomenon as a single or two-step process, researchers frequently ignore an even more fundamental initial step during which sympathy is mobilised irrespective of any willingness or unwillingness to participate in movement activity (see, for example, Barkan et al. 1995; Beyerlein & Hipp 2006; Kitts 1999; McAdam 1986; Nepstad & Smith 1999; Passy & Giugni 2001; Walsh & Warland 1983; Wiltfang & McAdam 1991). In other words, scholars often fail to examine how movement supporters are initially differentiated from non-supporters. This study focuses narrowly on this frequently overlooked first step. Drawing on a nationally representative sample of adults from the United States – who either sympathised with or opposed anti-immigration activism conducted by minuteman organisations – I identify attributes differentiating contemporary anti-immigration movement supporters from non-supporters. 1.4 Elements of power devaluation theory (McVeigh 1999, 2001, 2009) are used to understand this differentiation. Whereas political process and resource mobilisation theories were developed to explain how relatively powerless groups mobilise to create change (see, for example, McAdam 1982; McCarthy & Zald 1977), power devaluation theory illuminates why and how relatively powerful groups organise to restore, maintain, or increase power and privilege. While resource mobilisation and political process theories can provide insight into the role resources or political contexts play in constraining and capacitating anti-immigration mobilisation (see, for example, Ward 2013), because these perspectives place a black box around grievance formation, they overlook the empirical reality that conservative movements are often spurred by the emergence of new grievances triggered by waning levels of power and influence (McVeigh 1999, 2001, 2009), as well as a body of research suggesting micromobilisation unfolds as a series of steps, the first of which involves the formation and differentiation of grievances (Beyerlein & Hipp 2006; Klandermans & Oegema 1987; McAdam 1986; Oegema & Klandermans 1994). By taking a step back and asking the question: how do grievances form in the first place?, power devaluation theory allows us to peer into this black box left behind by resource mobilisation and political process theories. 1.5 Of course, this is not to say that the criticisms (see, for example, McAdam 1982) levelled at theories which took grievances to be the main determinant of mobilisation – such as, mass-society and collective-behaviour theory – are misguided. While critics astutely revealed the weakness in these approaches, they may have also overstated the insignificance of grievances, attitudes, and mental traits for mobilisation (Goodwin et al. 2000; Jasper 1997; Jasper & Young 2007). While power devaluation theory focuses attention on the role newly emerging grievances play in spurring mobilisation, it does not adhere to those same problematic assumptions derided by resource mobilisation and political process theorists. Instead of assuming participants are irrational, isolated, malcontents, power devaluation theory assumes participants are socially embedded and engaged in rationally motivated political behaviour. Indeed, the approach incorporates insights from literatures on social movement framing to reveal how perceptions of shifting and waning power generate grievances necessary for mobilisation (McVeigh 2009: 198). Thus resource mobilisation scholars' criticisms of theories that took grievances as the main determinant of mobilisation are valid but not applicable to power devaluation theory. 1.6 Finally, this paper makes several key contributions. In particular, this paper uses power devaluation theory to both identify and lend theoretical coherence to those attributes and perceptions central to the contemporary U.S. anti-immigration movement's pool of potential participants. 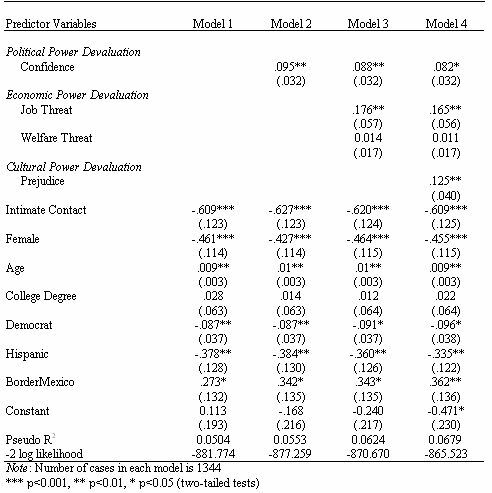 I rely on elements of power devaluation theory to lend meaningful interpretation to my findings that greater perception of economic threat, decreased confidence in political leadership, and greater levels of prejudicial cultural belief about Latinos distinguish anti-immigration movement supporters from non-supporters. 1.7 Moreover, whereas prior studies examined power devaluation theory's efficacy in predicting variation in state and county-level outcomes (e.g., McVeigh 1999, 2001, 2009), here insights are applied at the individual-level and merged with current micromobilisation theory to yield an analysis focusing on the first micromobilisation step in which movement supporters and non-supporters are differentiated. Power devaluation theory suggests shifting structural conditions trigger micro-level interpretive processes that, in turn, help facilitate micromobilisation. The interpretive processes at the initial stage in which certain individual attributes differentiate movement supporters from non-supporters, however, remain the focus of this paper. 1.8 Lastly, despite power devaluation theory's origins in the study of racist hate organisations (McVeigh 1999, 2001, 2009), this framework can be used to understand the first step in the micromobilisation process across a wider spectrum of right-leaning cases than, perhaps, originally envisioned. I argue its general framework can be extended successfully to help us interpret the important role grievances play in jumpstarting micromobilisation in other understudied conservative cases. That movement congruent grievances and movement support play a central role in initiating micromobilisation processes, more generally, has been demonstrated empirically (Klandermans 1997; Klandermans & Oegema 1987; Oegema & Klandermans 1994) and is routinely implied in a number of social movement studies, as well (see, for example: Beyerlein and Hipp 2006; McAdam 1986; Barkan et al. 1995; Kitts 1999; Kim 2002;Nepstad & Smith 1999; Oliver 1984; Passy & Giugni 2001; Walsh & Warland 1983; Wiltfang & McAdam 1991). 2.1 Prior research suggests social movement micromobilisation – getting involved in social activism – should be thought of as a process involving a series of steps in which entering into a subsequent stage requires passage through its antecedent (Beyerlein & Hipp 2006; Klandermans 1997; Klandermans & Oegema 1987; Oegema & Klandermans 1994). Despite such theoretical advancements, empirical studies utilising one and two-step models of micromobilisation proliferate. While useful, these studies often ignore critical steps in the micromobilisation process. This obfuscation is a result of sampling techniques and research designs employed in these studies. The central problem is that these studies begin with individuals already sympathetic to a movement and then focus on factors influencing (among the sympathetic) willingness to participate and/or actual participation (see, for example, Barkan et al. 1995; Kitts 1999; McAdam 1986; Nepstad & Smith 1999; Passy & Giugni 2001; Walsh & Warland 1983; Wiltfang & McAdam 1991). Figure 1 illustrates this problem. Because only sympathisers are sampled, there is no adequate reference group to which these individuals can be compared in order to examine the differentiation of movement sympathy. Researchers thus often fail to examine attributes differentiating movement sympathisers and non-sympathisers (for notable exceptions see: Klandermans 1997; Klandermans & Oegema 1987; Oegema & Klandermans 1994). Figure 1. Diagram highlighting truncated sampling procedures of typical micromobilisation studies. 2.2 Despite popular research practices, extant theory suggests the most basic step in the micromobilisation process is the delineation of the mobilisation potential (Klandermans 1997; Klandermans & Oegema 1987; Oegema & Klandermans 1994).1 In the initial stage of the micromobilisation process, individuals are sorted according to whether they do or do not sympathise with a movement. Sympathisers, or potential recruits, make up what Klandermans and Oegema (1987) term the mobilisation potential (also see: Cohen 1985; Kriesi et al. 1993; McVeigh 1995). Their attitudes are aligned with the movement's means and/or goals (Klandermans & Oegema 1987: 519). Importantly, individuals not belonging to a movement's mobilisation potential will not involve themselves in the movement even if targeted for recruitment by social movement organisations (SMO). This suggests that the boundaries within which a recruitment campaign may succeed are delimited by the mobilisation potential (Klandermans & Oegema 1987), thereby making its demarcation a crucial first step in the sequential micromobilisation process. Explaining this initial stage is critical because 'it constitutes a necessary, but not sufficient pre-condition of final mobilisation' (Kriesi et al. 1993: 157). 3.1 Anti-immigration organisations at the forefront of the contemporary anti-immigration movement, such as MMP and MCDC, follow earlier American nativist movements and frontier vigilante groups espousing fear of foreigners and the need for law and order. Perhaps the earliest, most coherent anti-immigration movement in the United States began in the mid-1800s with the emergence of the 'Know-Nothing' movement, whose primary goal was to preserve American nationalism in the face of unwanted foreign immigration (Higham 2006). What coheres past and present forms of American nativism, however, is a particular brand of nationalism in which foreigners are treated with suspicion. If, as Higham (2006: 4) argues, nativism is an 'intense opposition to an internal minority on the grounds of its foreign (i.e., "un-American") connections', then it is indeed nativism that partly fuelled past and continues to fuel present forms of anti-immigration mobilisation. Seeking to uphold a unique, often romanticised American way of life (Shapira 2013), contemporary anti-immigration organisations revel in their self-proclaimed role as guardians against foreigners from Mexico, Central and South America. However, these contemporary organisations reflect not only past forms of nativist mobilisation but have successfully and innovatively fused this with America's longstanding tradition of vigilantism (Ward 2013). 3.2 As Doty (2009: 23) points out, the concept vigilantism is central to understanding contemporary anti-immigration mobilisation not simply because it unifies distinct events and organisations tethered loosely under the name minuteman, but also because it accurately describes the strategies and tactics these groups regularly employ. In particular, minutemen embody what historians refer to as neovigilantism or western style vigilantism (Brown 1975; Davis 2006). Whereas classic vigilantism targeted mostly outlaws, neovigilantism's purpose is to rid areas of specific racial and ethnic groups by appealing to the need to uphold the integrity of the law. In contemporary times this focus has turned towards immigrants from Mexico, Central and South America (Ward 2013). While early forms of neovigilantism looked much like the idealised forms trotted out by Hollywood production companies, by the 1970s border vigilantism in the United States had been radically transformed into something much more distant and cautious, emphasising observing and patrolling over direct intervention (Doty 2009). 3.3 Contemporary minuteman organisations can be characterised as nativist neovigilante groups operating under a veil of legitimacy characteristic of the western vigilante tradition while employing patrol, observe and report tactics borrowed from predecessors of the 1960s and 1970s. Contemporary minuteman organisations rally around themes of law and order, safety and security, and the inability of government to enforce immigration policy and protect its citizens (Chavez 2008; Dove 2010). However, for minuteman organisations these central themes themselves are anchored by a society-wide, taken for granted constellation of specific negative sentiments which cultural anthropologist Leo Chavez (2008) calls the 'Latino Threat Narrative'. 3.4 The past forty years of the discursive history of Mexican immigration to the U.S. has generated a perception among many in the United States that Latino/as represent a growing threat to Americans (Chavez 2008: 22). This narrative perpetuates the myth that Latino/as refuse to integrate into U.S. society both economically by paying taxes and culturally by learning to speak English and participate in traditional American cultural practices. Latino/as, the narrative argues, seek to establish their own colony within the United States and hope to conquer land that once belonged to Mexico. The presence of so many unauthorised Latino/as in the United States undermines the entire concept of citizenship (Chavez 2008: 177). Chavez (2008: 22) goes on to argue that what might at first glance seem like unrelated characterisations about Latinos is, in fact, tightly bound together by a rather cohesive 'history of ideas, laws, narratives, myths and knowledge production…[constituting] a discourse, a formation or cluster of ideas, images and practices that construct knowledge of, ways of talking about, and forms of conduct associated with a particular topic, social activity or institutional site in society.' These popular discourses then construct particular 'truths' about exactly what kinds of people Latino/as are and are not. Research by Chavez (2008) and Santa Ana (2002) shows such discursive formations are frequently promulgated through popular media and political discourse, thereby shaping public opinion. In this sense, popular discursive formations actively construct an environment in which anti-immigration sentiment is widely supported. Minuteman organisational rhetoric borrows from this long history of such discursive formations, thereby sustaining the threat narrative (Chavez 2008: 40). 3.5 Of course, Minuteman organisations like MMP and MCDC were not the first of their kind to promote civilian patrol at the U.S.–Mexico border. As Doty (2009) points out, by the 1970s border vigilantism was becoming increasingly characterised by a more observe-and-report approach. By 1977, for instance, members of the infamous Ku Klux Klan had initiated The Klan Border Watch along stretches of the Texas, Arizona and California borders (Burghart 2005). Not too long after in 1986, about two dozen members of the Civilian Material Assistance travelled to Arizona to document and discourage drug and human traffickers (de Armond 2005). 3.6 However, it was not until the late 1980s and early 1990s that citizens en masse began participating in organised vigilante activity along the U.S.–Mexico border (Doty 2007: 117). While initially concentrated primarily along the San Diego border, these civilian border operations began cropping up in Arizona after the United States government launched the prevention through deterrence policy and Operation Gatekeeper (Vina et al. 2006). The first major contemporary development in this phenomenon began in 1989 with the Light Up The Border movement founded by Muriel Watson, the widow of a U.S. border patrol agent. Fed up with a lack of enforcement along the border and hoping to spur the government to construct a barrier and lights, she convinced a few dozen supporters to drive to the San Diego-Tijuana border to both literally and figuratively shed light on the situation (Contreras 2006). By 1990 efforts became more organised and several protests were conducted. In March of that year over 1000 people gathered along the border to shine their car lights into Tijuana (McDonnell 1990). Once the media and Congress took notice, a barrier was quickly erected. Having achieved its goal, the Light Up the Border campaign dissolved soon thereafter. In its place emerged numerous other groups of citizens, such as The Border Solution Task Force and, much later on, the U.S. Citizen Patrol (Nunez-Neto 2005: 3). 3.7 Beginning in the early nineties, once loosely connected groups and patrol events began to merge into a growing nativist, neovigilante movement (Doty 2009). California resident Glenn Spencer helped bring coherence in 1992 by founding Voices of Citizens Together (VCT) in response to race riots sweeping through Los Angeles after the Rodney King beating. Soon thereafter VCT and its partners were instrumental in the development of Proposition 187 which would have removed unauthorised immigrants from public schools and barred them from receiving health and social services. By 2002 Spencer had moved to Arizona and helped established the American Border Patrol (ABP), an organisation enlisting volunteers to help monitor and report unauthorised border crossings using sophisticated technology. 3.8 Along with Spencer, Jack Foote of Arlington Texas was another individual responsible for pioneering the kind of early border vigilantism later popularised by MMP and MCDC. In June 2000, Foote helped found Ranch Rescue, an organisation known for its military-stylised patrol operations in which members donned full camouflage fatigues and face paint and carried assault rifles and pistols (Moser 2003). 3.9 Echoing sentiments expressed by Barnett and Foote, in 2002 Chris Simcox emerged as a prominent figure among the contemporary anti-immigration movement when he established the Tombstone Militia. Later changing the name of the group to Civil Homeland Defense (CHD), the organisation initially focused on patrolling private ranch property. Over time, these early organisations helped pave the way for the contemporary anti-immigration movement led by citizen patrol organisations like MMP and MCDC, the two most well funded and nationally prominent organisations to emerge in the last decade. 3.10 In April of 2005, MMP grabbed the media spotlight by launching a massive border patrol campaign in southern Arizona. In so doing, anti-immigration activists created a 'spectacle of surveillance on the Arizona–Mexico border' (Chavez 2008: 132), firmly placing immigration and border security at the forefront of public debate. In 2006 MMP co-founder Chris Simcox went on to establish MCDC, and the two organisations began spreading their anti-immigration campaign. As prominent leaders in the contemporary anti-immigration movement (Doty 2009; Dove 2010), MMP and MCDC not only used highly visible border patrol campaigns to raise awareness (Gilchrist & Corsi 2006), but they also relied on more institutionalised political channels to redress their grievances and promote fence construction along borders, mass deportations and increased border militarisation (Doty 2009; Dove 2010; Gilchrist & Corsi 2006). 3.11 As Ward (2013) suggests, contemporary anti-immigration activism along the U.S.–Mexico border was most notably a response to larger shifts in the United States' economic and immigration policies. Chief among these changes included implementation of the North American Free Trade Agreement (NAFTA) and the General Agreement on Tariffs and Trade (GATT), both of which led to greater economic integration between the United States and Mexico. At the same time, however, the United States insisted on keeping its labour markets separate (Massey et al. 2002). This lopsided integration generated a more punitive approach to immigration and border policy in the United States, embodied most notably in the passage of The Immigration Reform and Control Act (IRCA) in 1986 and the Immigration and Naturalization Services' (INS) adoption of prevention through deterrence strategies beginning in 1993 (Andreas 2009; Vina et al. 2006). In this climate of border control and lopsided integration between the United States and Mexico, entrepreneuring government officials successfully equated safe borders with more militarised borders. Appearing tough on immigration and border security became not only politically expedient, but also necessary (Andreas 2009). 3.12 Yet, shifts in the North American political economy did not by themselves trigger the larger waves of anti-immigration mobilisation recently witnessed in the United States. Rather, they created a window of opportunity for anti-immigration mobilisation by facilitating the emergence of a social and political landscape where public fear and anger over border security and immigration could be transformed into political currency by entrepreneuring political actors. In this newly developing landscape government officials had major incentive to weave together issues of immigration, drug trafficking, and terrorism – and to pursue restrictionist and punitive immigration policy – to create both the illusion that the government was getting tough on border security and to create a scapegoat (unauthorised immigrants) that American's could more clearly get behind (Ward 2013). 3.13 At the time the survey used in this paper was administered by the Pew Research Center in 2006, minuteman organisations were enjoying an unprecedented level of exposure. Groups such MMP and MCDC, in particular, represented a visible force at the front of this movement (Center for New Community 2005; Navarro 2009). These two organisations, more than any others, ushered the anti-immigration movement into the mainstream, in turn, becoming a veritable poster child for the cause (Doty 2009). 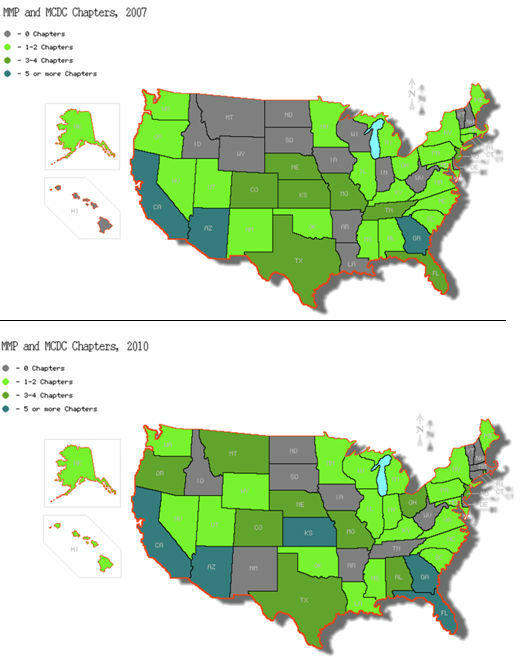 As seen in figure 2, between 2007 and 2010, MMP and MCDC chapters spread across the United States, creating in-roads into new areas while maintaining popularity in others. By 2010 a total of 319 anti-immigration groups operated in the United States. Of these, nearly 40 percent claimed affiliation with either MMP or MCDC (Southern Poverty Law Center 2011). Membership statistics for these groups are a closely guarded secret. However, in 2006 MCDC claimed it had over 9,000 members. In 2007 MMP's executive director claimed the organisation had over 200,000 members (Gilliam 2007). Reports from the Center for New Community (2012) placed MCDC membership at roughly 40,000 by 2010. 3.14 However, at the same time individual minuteman organisations and leaders were drumming up media attention and mobilising a grassroots campaign against immigration, the network of fundraising, think-tank and publishing organisations operating away from the United States' borders, were helping to engineer a veil of legitimacy for this grassroots mobilisation. These well connected, Washington, D.C.-based organisations leveraged mass-grievances generated by minuteman mobilisation – along with their own money, publishing power and insider position – to exert pressure on state and federal legislatures to pursue anti-immigration agendas and to counter pro-immigration gains made during 2006. 3.15 After being caught off guard in 2006 by the massive upwelling of pro-immigration opposition (Hastings 2009), well-funded and politically-connected anti-immigration organisations such as The Federation for American Immigration Reform (FAIR), NumbersUSA, and the Congressional Immigration Reform Caucus (CIRC) made it their mission to defeat comprehensive immigration reform in 2007, especially the Bush-Kennedy Bill. While grassroots anti-immigration activism had garnered needed media attention and created excitement from below, after the May 2006 pro-immigration rallies it was clear the anti-immigration movement would need Congressional support to pass restrictionist legislation and stymie pro-immigration legislative reform. Washington, D.C. insiders, especially FAIR, proved invaluable in this regard. 4.1 In this section, I draw on principles from power devaluation theory (McVeigh 1999, 2001, 2009) to identify and make sense of attributes differentiating anti-immigration movement supporters and non-supporters. In so doing, I first demonstrate that elements of power devaluation theory offer insight into cases beyond the kind of blatantly racist and violent conservative mobilisation like the Ku Klux Klan from which the theory was originally developed. Second, much of the research employing the power devaluation model utilises macro-level data, measuring how economic, political and cultural structural shifts produce mobilisation similarly measured at the state and county level (e.g., McVeigh 1999, 2001). Despite modelling right wing mobilisation as the result of structural changes that induce cognitive shifts in how individuals interpret their increasingly powerless situations (2009), little systematic attention has been given to whether or not these attitudes widely exist at the individual level, nor has attention been paid to the content of these perceptual shifts predisposing individuals to right wing activism. Using nationally representative, individual-level public opinion data, this paper takes such perceptions as its starting point to illuminate the first step of the contemporary anti-immigration movement's micromobilisation process. By identifying shared perceptions distinguishing anti-immigration movement supporters from non-supporters, I shed light on those attitudes and beliefs demarcating the anti-immigration mobilisation potential. 4.2 Power devaluation theory proposes that members of relatively advantaged social groups engage in conservative mobilisation because they begin to interpret shifting conditions in established power relationships and institutions as threats to their established economic, political and cultural power. The fundamental assumption is that conservative mobilisation is thus fuelled by a desire to combat this power devaluation, to restore, preserve, or expand waning power (McVeigh 2009). Moreover, once individuals have decided that collective power is waning and cannot simply be restored or expanded by acting through traditional institutional channels, this realisation generates strong pressures to operate outside such channels (i.e., in a social movement) and also encourages the aggrieved individuals to accumulate and deploy organisational resources and take advantage of emerging political opportunities. One means by which organisational resources are accumulated and deployed and emerging opportunities capitalised upon is through the adoption of new framing strategies by movement leaders. As Dove (2010) empirically demonstrates, anti-immigration organisations have been adept in generating new frames for recruitment and mobilisation. Processes of frame alignment (Benford & Snow 2000; Snow et al. 1986) and interpretations favourable to conservative activism, then, are an essential mechanism mediating shifting macro-conditions and eventual movement mobilisation. 4.3 Power devaluation theory also implicitly adopts a market-oriented perspective to understand conservative social movement mobilisation. As McVeigh (2001: 11) puts it, conservative mobilisation can be understood 'as a rational response to [structurally induced] devaluation in the…purchasing power' held by a group. Political and economic arenas are 'markets of exchange' in which 'labor, wages, goods, services, and money' or 'votes, representation, contributions and patronage' are 'purchased' (McVeigh 2001: 11). Supply and demand affect purchasing power just as they do in microeconomics. An overabundance of an item or a drop in demand for an item reduces that item's value. A simultaneous decrease in economic and political purchasing power for a group of individuals sharing a common position in an exchange market produces incentives to engage in extrainstitutional politics (2001: 13). For example, when white Americans in the 1920s that had previously enjoyed great economic and political power began recognising a decline in that power and also realised power could not be restored through traditional institutional channels, strong incentives to recapture that waning power through social movement mobilisation emerged. Hence, why the Ku Klux Klan experienced significant growth during this period (McVeigh 2009). 4.4 In the case of contemporary anti-immigration activism, structural shifts, such as a rapid increase in the population of unauthorised migrants from Mexico, Central and South America, changes in the North American political economy, and political strategising over U.S. border security are partly responsible for creating a perceived devaluation of power for individuals now competing with migrants for jobs and for whom legal citizenship confers special rights and privileges (Ward 2013). This perceived loss of power encourages individuals to interpret structural shifts in ways predisposing these individuals toward right wing mobilisation. As perceptions are altered, entrepreneuring SMOs take advantage of new framing opportunities to mobilise potential constituents. Anti-immigration organisations have proved adept at doing so (Dove 2010). At the time data for this paper were collected by Pew Research Center in 2006, MMP and MCDC, for instance, relied heavily on discursive formations attached to a Latino threat narrative (Chavez 2008; Dove 2010). Changing perceptions and framing opportunities guide identification of emerging market competitors whose presence is to be viewed as a threat. Importantly, then, right wing mobilisation is dependent on a series of events in which individuals' perceptions of structural changes become motivating forces to be tapped and channelled by SMOs. As the process unfolds, SMOs engage in framing strategies to exploit political opportunities and resources, thereby fuelling mobilisation (McVeigh 2009: 39). 4.5 Threat and the perception thereof factor largely into popular discourse on U.S. immigration and security (Ana 2002; Andreas 2009; Chavez 2008). Literature on realistic group conflict suggests that feelings of hostility toward minority groups result from majority group members' belief that minorities pose a real threat (Bobo 1983; Citrin et al. 1990; Citrin et al. 1997; Levine & Campbell 1972). For a power devaluation model of mobilisation, however, the perception of threat is one mechanism through which real structural changes mobilise actors. In this vein, effective right wing mobilisation hinges on SMOs constructing collective action frames that resonate with lived experiences of those individuals perceiving such changes as threatening (McVeigh 2009). In light of popular associations made between Latinos and 'threat' (Ana 2002; Chavez 2008) and recent structural changes in the United States' economy wrought by (unauthorised) immigration (Borjas 1999; Massey et al. 2002; Pritchett 2006; Rothman & Espenshade 1992; Smith & Edmonston 1997), minuteman SMOs frequently succeed in achieving frame alignment (Benford & Snow 2000; Snow et al. 1986). According to Dove (2010), for example, economic threat factors prominently into diagnostic frames minuteman SMOs produce. Measures of individual economic threat have been found to be strong predictors of respondents' attitudes towards recent immigrant groups (McLaren 2003) and minority groups generally (Olzak 1992; Ridgeway 1997). 4.6 Anti-immigration SMOs like MMP and MCDC perceive immigrants to be economically threatening in two ways. First, minutemen argue immigrants, especially unauthorised, take American jobs (Chavez 2008; Dove 2010). Second, minutemen perceive unauthorised immigrants to be a drain on U.S. social service and welfare programs (Doty 2009; Dove 2010; Gilchrist & Corsi 2006). Because threat factors prominently into minuteman framing strategies (Dove 2010), I expect increased perceptions that one is competing with immigrants for jobs and increased perceptions that immigrants from Latin America end up on welfare to increase the odds that an individual supports anti-immigration activism and, therefore, belongs to the anti-immigration movement's mobilisation potential. 4.7 Minuteman SMOs harangue elected officials for their inability to adequately handle the rising number of unauthorised entries to the U.S. and the perceived economic strain this produces. Political leaders are primary targets of minuteman frustration and blame attribution (Dove 2010). In fact, Gilchrist and Simcox started MMP 'to protest the refusal of the Congress and the President to protect [U.S.] borders from illegal immigrants…' and 'to bring national awareness to the decades-long disregard of effective U.S. immigration law enforcement' (Chavez 2008: 133–134). At MMP's inaugural border watch campaign, activists wore t-shirts reading, 'Americans doing the job government won't do' (2008: 134). Posters for the event carried the same slogan, and volunteers carried "Undocumented Border Patrol Agent" badges (Holthouse 2005: 1). Minutemen represented themselves as 'citizens…coming to the defense of the nation's borders which were under siege by invading force that the nation's own government was unwilling or unable to control' (Chavez 2008: 135). Their patriotic discourse mobilised minutemen not only against immigrants but government officials as well. Perceiving their political power was waning as a result of changes wrought by immigration, minutemen activated cultural identities underpinned by collective narratives steeped in values of citizenship and legality and fear from threats (believed to be) posed by Latinos. This perceived devaluation in political power was experienced as a growing dissatisfaction with government and declining confidence in political leadership, which resulted in incentives to mobilise. Because anti-immigration activists like those in MMP and MCDC perceive that political leaders have failed (Doty 2009; Dove 2010; Chavez 2008; Shapira 2013), they attempt to secure borders themselves. Therefore, a lower level of confidence in political leaders to adequately manage immigration and border issues should be associated with an increase in the odds an individual approves of anti-immigration activism led by minutemen. Doing so places an individual firmly within the anti-immigration movement's mobilisation potential. 4.8 Cultural beliefs and values may play a role in processes of power devaluation. Cultural appeals stimulate demand for what aggrieved groups can offer, while attacks on perceived threats restrict the supply of competitors. On the one hand, minutemen exchange moral values of masculinity, respect for law, and their cultural identity as 'true' Americans for greater moral purchasing power in debates over immigration reform (Shapira 2013). On the other, minutemen hope labelling migrants economic threats, un-American, and even security risks will help restrict their numbers. 4.9 Cultural attacks on Latino migrants sky rocketed in the early 1990s after it became politically expedient to mark unauthorised immigration as a national crisis (Andreas 2009; Massey et al. 2002; Sanchez & Pita 2006). In this political climate, minuteman organisations use and perpetuate widely accepted Latino threat narratives as they recruit and proselytize (Chavez 2008; Dove 2010; Doty 2009). Media reports indicate members of MMP and MCDC are not only frustrated with government but harbour animosity toward Latino migrants (Kelly 2005). These anti-immigration organisations draw clear boundaries between legal American citizens holding all the rights and responsibilities of citizenship and the unauthorised Latino migrants minutemen believed devalue these sacrosanct rights. As American citizens come to believe their own cultural power is waning as a result of unchecked, unauthorised immigration to the United States, a rising tide of prejudicial, anti-Latino sentiment has formed. Therefore, I expect more intense prejudicial attitudes to be associated with increased odds of support for minuteman anti-immigration activism. 5.1 Data come from a public opinion survey conducted by the Pew Research Center from February 8 to March 7, 2006 (Kohut & Suro 2006) – less than one year after MMP launched its inaugural border watch campaign and MMP and MCDC were subsequently thrust into the national media spotlight. This was a telephone survey representing English and Spanish-speaking Americans 18 years of age and older who resided in households in the continental United States, conducted by Schulman, Ronca, and Bucuvalas, Inc. The survey was carried out using random digit dialing method, and the sample is a random digit sample of telephone numbers taken from telephone exchanges in the continental United States. Random digit samples of telephone numbers selected from exchanges within Metropolitan Statistical Areas (MSA) – as defined by the U.S. Bureau of the Census – were used in these areas. 5.2 Several steps were taken to mitigate bias and ensure the sample's representativeness. First, telephone exchanges were selected with probabilities proportional to their size. Telephone numbers were proportionally stratified by county and by telephone exchange within county. Second, samples were released to interviewers in replicates. In so doing, one can be sure complete call procedures were adhered to for the entire sample. This distribution method also ensured that the distribution of numbers called was appropriate for each region. Third, call attempts were purposefully staggered over times of day and days of the week to maximise the likelihood of reaching potential respondents. Finally, in order to ensure proper representativeness of the sample in terms of age and gender, interviewers asked to speak with the 'youngest male, 18 years of age or older, who is now at home'. When there was no eligible man available, interviewers asked to speak with 'the youngest female, 18 years of age or older, who is now at home'. Response rate was 30 percent. Refusal and cooperation rates were 42 and 45 percent, respectively. The final nation-wide sample size was 2000. 5.3 This paper examines characteristics important in demarcating the anti-immigration mobilisation potential. In order to measure support for this movement, I relied on the following survey question, 'There are now some groups of people called "Minutemen" who are looking for illegal immigrants along the Mexican border in order to report them to the authorities. Do you approve or disapprove of what these groups are doing?' Those who approved are considered to be part of the anti-immigration mobilisation potential (Approve = 1; Disapprove = 0). 5.4 Confidence in Political Leadership: To assess whether or not perceived political power devaluation differentiated anti-immigration movement supporters from non-support, I relied on the following question, 'Thinking now about our political leaders, please tell me how much confidence you have in the governor of your state to do the right thing regarding the issue of immigration… do you have a lot of confidence, some confidence, not too much confidence, or no confidence at all?' Responses are coded one to four, with one being 'A lot of confidence' and four being 'No confidence at all'. 5.5 Job Threat and Welfare Use: To assess whether or not perceived economic power devaluation differentiated anti-immigration movement supporters from non-support, I used two measures capturing the dual sense of economic threat minutemen associate with migrants and immigration. Perceived job threat is measured using the question, "Do you believe that you or a family member has ever lost a job or not gotten a job because an employer hired immigrant workers instead, or don't you think so" (Yes=1, No=0)? 5.6 Welfare and social service threat is measured using the question, 'Please tell me whether the following characteristic does or does not apply to immigrants from Latin American countries – Often end up on welfare' (Does Apply=1, Does not Apply=0). 5.7 Prejudice. To assess whether or not perceived cultural power devaluation differentiated anti-immigration movement supporters from non-support, I used the following question, 'I'd like your opinion of some groups. Would you say your overall opinion of Hispanics is very favourable, mostly favourable, mostly unfavourable, or very unfavourable?' Responses were coded one to four, with one being 'Very Favourable' and four being 'Very Unfavourable'. 5.8 Controls. In order to more confidently demonstrate robust dependence between perceptions of power devaluation and anti-immigration sympathy, I included several controls. Intimate contact with minority group members has been suggested as a mechanism through which prejudicial cultural beliefs held by majority group members may be mitigated. I examine the independent influence of intimate contact with minorities by using the following question, 'Do you have any friends or relatives who are recent immigrants (Yes=1, No=0)?' Gender is coded as a dummy variable (Male=0, Female=1). Age is measured in years. Education is measured as a dummy variable (4-year college degree or more = 1, less than 4-year college degree = 0). Whether or not a respondent self-identifies as Hispanic is captured using a dummy variable (Yes=1, No=0). Dummy coded variables also measure political party affiliation (Republican = 0; Democrat=1) and whether or not a respondent's state borders Mexico (borders Mexico = 1, does not border Mexico = 0). 5.9 Logistic regression is used to analyse results. Variables were entered step-wise to assess whether or not their inclusion improved upon the fit of previous models. I began by regressing approval for anti-immigration activism on the set of controls. I then added power devaluation variables one at a time as theoretical blocks. Careful attention to building models based on an understanding of the case and prior research underscores the analytic strategy utilised in this paper. Logistic regression coefficients are reported in table 2 as logits (log of the odds), but I refer to odds ratios (elogits) when providing interpretations of the results from the logistic regression models in the text. 6.2 Table 2 presents four multivariate models predicting approval of anti-immigration activism. Measures of perceived political, cultural, and economic power devaluation were – net of other factors – significant predictors of anti-immigration movement sympathy. Likelihood ratio tests indicate the inclusion of each theoretical dimension of power devaluation improved model fit. Interestingly, however, the welfare threat variable was not significantly correlated with anti-immigration support. In other words, the data demonstrated that not all issues openly debated by minuteman organisations helped differentiate movement supporters from non-supporters. While prejudicial beliefs about Latinos, a lack of confidence in political leadership, and a sense of job insecurity were attitudes widely held by anti-immigration supporters, concern over immigrants' use of welfare resources was not statistically correlated with movement support. Despite the fact that all of these issues were being argued publicly and framed accordingly by anti-immigration organisations, it turns out that some anti-immigration issues mattered more than others in differentiating supporters from non-supporters. These results, therefore, provide a more nuanced understanding of the issues that lie at the heart of support for anti-immigration activism in the United States. In turn, they also paint a clearer picture of how the process of becoming a potential participant in the movement begins in the first place. 6.3 Net of other factors, lower confidence in a governor's ability to properly handle important immigration issues increased the odds of supporting anti-immigration activism by nearly 10 percent, relative to individuals possessing more faith in their governor. Comparing those individuals with the least amount of confidence to those with the most confidence in their governor, having the least amount of confidence increases the odds of supporting minutemen by nearly 30 percent [exp(.082) = 1.09; p-value <0.05]. Because minuteman organisations espouse a strong belief in popular sovereignty and perceive that elected officials have failed the American public, low confidence in political leaders predisposes individuals to support anti-immigration activism. 6.4 Perceived economic power devaluation, manifesting itself in feelings of job insecurity, was a strong predictor of approval for anti-immigration activism. Net of other factors, the odds of supporting minutemen increased by nearly 20 percent for individuals believing job security had been eroded by the influx of migrant workers, relative to those individuals believing otherwise [exp(.165) = 1.18]. Research by Dove (2010), for example, shows that minutemen frame unauthorised immigrants as threats to American jobs in order to achieve resonance with groups of economically dispossessed individuals. Individuals interpreting a threat to their economic power are more susceptible to these framing strategies employed by SMOs like MMP and MCDC. It is also possible that, to a degree, the job threat variable possesses some overlap with social class. Individuals expressing a stronger sense of economic vulnerability – presumably accompanied by lower wages, lower occupational prestige, and even unemployment – may be more sympathetic to the anti-immigration cause. And while some aspects of social class, such as job vulnerability, may certainly be related to support for anti-immigration activism, findings in this paper suggest the relationship may not be entirely clear-cut. For example, educational attainment – an oft-used proxy for class position – was, in this instance, statistically unrelated to support for anti-immigration activism. In fact, research by Skocpol and Williamson (2012) on similar conservative Tea Party mobilisation in the United States found that anti-immigration advocates were, on average, highly educated and possessed at least some college education. In other words, while that dimension of social class rooted in economic standing (such as occupation, earnings, and status) may bear a close relationship to anti-immigration support, other dimensions such as educational attainment appear to be less closely or, perhaps, not at all linked to this outcome. This strengthens my assertion that economic power devaluation, apart from some dimensions of social class, exerts an independent influence on the structuring of anti-immigration support. Finally, the association between Latino immigrants and welfare use was non-significant. This may indicate that support for anti-immigration activism hinges more on perceived threats to the individual rather than the collective good, which is counter to what some researchers have found in studies of threat (Rosenstein 2008). 6.5 A perceived devaluation of cultural power was also associated with support for minutemen. Net of other factors, the odds of supporting anti-immigration activism increased by nearly 13 percent for individuals holding greater prejudice toward Hispanics, relative to individuals expressing lower levels of prejudice [exp(.125) = 1.13]. Comparing individuals with the least favourable view of Hispanics with those holding the most favourable view, one sees that high levels of prejudice increase the odds of supporting anti-immigration activism by almost 40 percent. That each dimension of power devaluation exercised independent and significant influence in distinguishing supporters from non-supporters underscores that at this initial mobilisation stage, perceived devaluation in one dimension alone may be enough to consider an individual part of the anti-immigration mobilisation potential. 6.6 Although not the focus of this paper, several demographic factors produced significant effects, including age, gender, political orientation and ethnicity. While the magnitude of the age coefficient was miniscule [exp(.009) = 1.00; p-value <.01], being female, democrat, and Hispanic reduced the odds of supporting anti-immigration activism by 37 percent [exp(-.455) = .63; p-value <.001], 9 percent [exp(-.096) = .91; p-value <.05], and 28 percent [exp(-.355) = .72; p-value <.01], respectively. Interestingly, among these factors gender had the strongest negative effect on support for minuteman anti-immigration activism. Part of the gender effect stems from the fact that women, regardless of age, are also more likely than men to identify as democrats (Newport 2009), which have traditionally opposed extreme restrictionist immigration measures and fought for immigrants' rights. This may also help explain the lower magnitude for the coefficient associated with the democrat variable. Moreover, this finding is consistent with qualitative studies suggesting men tend to dominate border vigilante activism in particular (Doty 2009; Dove 2010). Shapira's (2013) ethnographic study of border vigilante organisations, for instance, found vigilante border activism to be largely organised around tropes of masculinity and militarisation. 6.7 Those demographic factors with the largest effect, however, were not individual attributes, but structural conditions. Intimate contact and residence in a state bordering Mexico exhibited powerful effects on respondents' attitudes toward minuteman organisations. Having friends or family that were recent immigrants decreased the odds of anti-immigration support by approximately 46 percent [exp(-.609) = .54; p-value <0.05]. Residing in a state bordering Mexico increased the odds of supporting minuteman organisations by nearly 40 percent [exp(.362) = 1.39; p-value <0.01]. This evidence suggests that structural conditions are related to levels of support for the anti-immigration movement. While this is generally consistent with power devaluation theory, it represents a unique finding given this paper's focus on the initial mobilisation of movement sympathy and not on actual participation. Research on this first step has typically focused on the differentiating power of attitudes (see, for example: Barkan et al. 1995). While attitudes and perceptions are indeed important, it appears structural factors warrant further attention at this initial step. Table 2: Unstandardised logistic regression coefficients predicting support for anti-immigration activism (logits and standard errors). 6.8 Results, however, should be interpreted cautiously. The cross-sectional nature of this data set, coupled with a lack of information on whether or not respondents already belonged to an anti-immigration organisation, make it difficult to make strong claims of directionality. McAdam (1986), for instance, found that deepening ideological socialisation resulting in the construction of an activist identity can occur after recruitment as a result of participation and subsequent increasing integration into activist networks. Yet, while attitudes and beliefs may deepen or change once an individual is immersed in a movement, initial movement sympathy (i.e., grievance aligned with the movement) is often a prerequisite to micromobilisation (Klandermans 1997; Klandermans & Oegema 1987; Oegema & Klandermans 1994). 7.1 Social movement scholars have long had an abiding interest in how and why individuals mobilise, recently conceptualising micromobilisation as, at least, a two-step sequence in which individuals must first become willing to participate and then translate this willingness into actual participation (Beyerlein & Hipp 2006; Klandermans 1997; Klandermans & Oegema 1987; Oegema & Klandermans 1994). Despite these theoretical advances, much of the empirical research on micromobilisation overlooks the fundamental stage in which sympathy is initially mobilised. Sympathetic individuals are not always willing to participate, yet a large majority of the research models micromobilisation as if this were true or simply treats the issue as a black box to be left unopened. Because the boundaries within which a movement may grow are initially defined by the mobilisation potential, understanding how this sympathy pool is demarcated is an important first step in understanding the larger micromobilisation process. The research presented here focuses narrowly on this first step and overcomes prior theoretical and empirical limitations by using a nationally representative sample of U.S. adults that either supported or opposed anti-immigration activism. 7.2 In addition to key individual and structural-level demographic factors, perceived economic, political, and cultural power devaluation significantly differentiated individuals based on their support for anti-immigration activism. Individuals who felt recent immigrants threatened their jobs were more likely to support anti-immigration activism and, therefore, belong to the pool of potential anti-immigration movement participants. The same held true for individuals experiencing decreased confidence in political leaders or increased prejudicial cultural beliefs about Latinos. These findings suggest that the mobilisation potential associated with the anti-immigration movement and minuteman SMOs is composed of individuals that feel economically threatened by immigrants, politically marginalised by incapable or unwilling politicians, and culturally dissimilar to, and in some respects, culturally superior to recent immigrants. Implications are discussed below. 7.3 Research suggests right wing mobilisation is not solely driven by a single obvious factor like racism and bigotry (McVeigh 1999, 2001, 2009; Ward 2013), despite popular perceptions to the contrary. Similarly, this paper demonstrates that conservative mobilisation cannot be reduced to a singular motivating factor. Instead, such movements succeed because they draw on grievances flowing from distinct cultural, political and economic currents. As McVeigh (1999: 1463) correctly points out, 'identifying the sources of movements' grievances…is crucial to understanding both the origins of conservative movements and the tactics they employ'. This is because many conservative movements are often mobilised by new grievances spurred by decreasing levels of power and influence (my emphasis; McVeigh 1999, 2001, 2009). Minutemen, for example, decry the devaluation of legal citizenship, 'true' American culture, economic security, and political efficacy (Chavez 2008; Doty 2009). 7.4 However, too often, grievances are (at best) conceived of as necessary background noise and nothing more, especially by traditional resource mobilisation and political process perspectives (Goodwin & Jasper 1999; Jasper & Young 2007). While these perspectives rightfully acknowledge a population must be aggrieved in order to mobilise, they perhaps too quickly discard grievances in favour of focusing on the role of resources or political context in constraining and capacitating activism. In this paper, however, I have shown that examining a more fundamental issue – namely, the power devaluation process by which new grievances are formed, as well as their unique content – is not only a fruitful avenue generally, but especially important when studying conservative mobilisation, which research has shown to be spurred precisely by the formation of newly emerging grievances among relatively empowered (rather than deprived) populations (see, for example, McVeigh 1999, 2001, 2009). 7.5 Moreover, by tracing the multiple grievances motivating anti-immigration activism and understanding these through the lens of power devaluation theory, it becomes clear that politically conservative mobilisation is every bit as rational as progressive mobilisation. It is also clearer that grievances matter, at least, in this first step in the micromobilisation process. While our relationship to right wing mobilisation may remain awkward (Snow 2006), we need not think of it as the kind of hasty, reactionary and visceral action some would have us believe (McVeigh 1999). 7.6 While anti-immigration micromobilisation is interesting in and of itself, this paper was motivated by the stark realisation that much of what we think we know about social movements is based on studies of progressive movements and organisations of the 1960s and early 1970s (McAdam et al. 2005: 2; McVeigh 1999). This raises important questions about the quality and depth of our empirical and theoretical knowledge about different kinds of social movements. It also raises questions about how – if at all – mobilisation processes differ between conservative and progressive movements. Results from this paper provide a useful starting point. 7.7 Generally speaking, political process and resource mobilisation theories were developed to explain how powerless groups mobilise to create change (McAdam 1982; McCarthy & Zald 1977) and not how relatively powerful groups mobilise to 'preserve, restore, and expand their collective privileges' (McVeigh 2009: 8). Applying such theories to cases of conservative mobilisation is problematic precisely because conservative movements are often spurred by the emergence of new grievances triggered by waning levels of power and influence. Unsurprisingly, then, resource mobilisation and political process theories have little to say about how grievances initially form, let alone their role in explaining mobilisation (though grievances are conceptualised as 'necessary' in some vague way). 7.8 Rather, political process and resource mobilisation theories tend to assume the entire population is (equally) aggrieved all the time and that such grievances remain fairly constant across time (McAdam 1982; McCarthy & Zald 1977). However, research by Beyerlein and Ward (2007), for instance, demonstrates that grievances within the American population are far from constant, thereby calling this tenuous assumption into question. In this paper, I do not simply contend that grievances matter. Rather, I am suggesting we pay closer attention to the content as well as the process through which grievances initially form because these may actually differ between politically conservative and progressive movements. Additionally, I contend that perceptions of power devaluation and attendant grievance formation may be especially salient and relevant during the initial step in the micromobilisation process in which mobilisation potentials are formed since it is at this early step that individuals are most commonly differentiated along attitudinal, rather than structural, lines (Klandermans & Oegema 1987). 7.9 This paper also represents an extension of McVeigh's work in another crucial way. Despite that McVeigh (1999, 2001, 2009) developed the power devaluation model to explain mobilisation of 'right wing' movements – movements that 'focus specifically on race/ethnicity and that promote violence as a primary tactic or goal' (e.g., the Ku Klux Klan) (Blee & Creasap 2010: 270–271) – I suggest the perspective's general insights can also help us understand how and why grievances initially form in what scholars refer to as 'conservative' movements, that is movements supporting 'patriotism, free enterprise capitalism and/or traditional moral order and for which violence is not a frequent tactic or goal' (Blee & Creasap 2010: 270–271). The contemporary anti-immigration movement in the United States falls most squarely into the latter category (Doty 2009; Dove 2010; Ward 2013). Future research may want to consider how general principles from power devaluation theory can be used to better understand differentiation of movement support across this political spectrum. Moreover, with regards to this first step in the micromobilisation process in particular, power devaluation theory promises to be more general in scope than, perhaps, McVeigh (1999, 2001, 2009) initially considered. 1 Munson (2008) is an exception. He found initial contact with a movement in the context of a 'turning point' constituted the first step in the micromobilisation process for the pro-life movement. However, Munson (2008) himself acknowledges his model may be less applicable in the context of (a) newly emerging social movements (b) lacking a clearly defined organisational infrastructure, such as the anti-immigration case examined here. The contemporary anti-immigration movement is relatively new (Chavez 2008; Doty 2009; Navarro 2009) and lacks a well-defined organisational infrastructure, relative to other historically notable movements (Navarro 2009: 193). Moreover, seventy-seven percent of Munson's (2008) activists possessed some degree of pro-life movement sympathy prior to becoming activists. 2 I focus explicitly on the cognitive mechanisms posited by McVeigh (2009) – the perceptions induced by structural shifts – and how well perceptions tied to devalued power predict support for the anti-immigration cause, rather than what structural shifts cause these perceptions (for a discussion of the latter, see Ward (2013)). While McVeigh's research on power devaluation does an excellent job of establishing correlations between state/county-level structural changes and state/county-level mobilisation, empirical research in this area has failed to examine whether or not – at the individual-level – people are actually interpreting these shifts as threats and power devaluation. Yet, it is critical to demonstrate that people actually hold such conservative perceptions facilitating mobilisation. Otherwise, we run the risk of relying completely on macro-level analyses committing an ecological fallacy. By using individual-level data and focusing on the content of individuals' perceptions, this paper helps establish empirically that specific anti-immigration perceptions are, indeed, linked to what has been shown to be a critical first step in the micromobilisation process – the differentiation of movement supporters and opponents. 3 This sampling technique avoids 'listing' bias and gives representation to both listed and unlisted numbers (including not-yet-listed). 4 This means, 'the number of telephone numbers randomly sampled from within a given county is proportional to that county's share of telephone numbers in the U.S. or within the MSA being surveyed. Furthermore, only working banks of telephone numbers were selected. Working banks consist of groups of 100 contiguous telephone numbers containing one or more residential listing' (Kohut & Suro 2006: 45). 5 This selection technique 'has been shown empirically to produce samples that closely mirror the population in terms of age and gender' (Kohut & Suro 2006: 45). 6 Response, refusal, and cooperation rates were calculated according to guidelines put forth by the American Association for Public Opinion Research (AAPOR) in 2011 using 'Response Rate calculator V3.1'. The refusal rate is the proportion of all cases in which a housing unit or respondent refuses to do an interview, or breaks-off an interview of all potentially eligible cases. The cooperation rate is the proportion of all cases interviewed of all eligible units ever contacted. In order to estimate the status of cases with unknown eligibility, I utilise the proportional allocation or CASRO method, which assumes the ratio of eligible to not eligible cases among the known cases is the same as the unknown cases (Smith 2003: 1–2). This method 'has the advantages of being easily calculated from information readily available from each individual survey and being conservative (i.e. producing a high estimate of the eligibility rate and thereby not inflating the estimated response rate)' (Smith 2003: 1–2). Although the response rate for this survey may seem somewhat low, Groves (2006) and Keeter et al. (2000) note that growing nonresponse to household surveys is becoming the norm. Brick et al. (2003) and Curtin et al. (2000) have shown that increasingly researchers have to make much greater number of calls in order to achieve a given response rate. Moreover, research indicates there exists only an indirect relationship between nonresponse and nonresponse bias (Groves 2006). 7 Analyses in this paper are based on 1344 cases. Individuals were given the option of indicating they had never heard of minutemen, not knowing, or refusing to answer. These individuals were eliminated from the analysis. Therefore, this paper focuses on identifying attributes associated with support for anti-immigration activism among respondents who have heard of minutemen. I assume individuals can only express meaningful approval or disapproval of groups they have heard of. Eliminating from the analysis individuals indicating they had never heard of such groups is non-problematic, given the focus in this paper. List-wise deletion was used for missing data on other variables. 8 Correlation matrix and variance inflation factor test (VIF) (not shown) reveal no problems of collinearity among independent variables. No VIF for any variable in the model exceeded 1.6. This is well below the accepted threshold of 10 (Belsley et al. 1980). 9 This is in contrast to McVeigh's (1999, 2001, 2009) assertions that mobilisation requires a simultaneous devaluation of power from more than one source. While this may be true when studying actual participation, it is unnecessary in mobilising initial movement sympathy, based on these data. I tested for interaction effects. However, none were significant. 10 The empirical record fails to show that grievances in the form of movement congruent beliefs and attitudes do not play an important role in jumpstarting the micromobilisation process (see, for example: Klandermans 1997; Klandermans & Oegema 1987; Oegema & Klandermans 1994). While work by Munson (2008) and Blee (1996, 2002) suggests that, in some instances, initial contact with a movement may precede and facilitate the development of movement-congruent attitudes, their research actually demonstrates that, while individuals do not always possess crystallised movement ideologies (or possess some beliefs but not others) prior to participating, they almost always are aggrieved, generally, and sympathetic with the movement prior to participating. ANA, O.S. (2002) Brown Tide Rising. Austin, TX: University of Texas Press. ANDREAS, P. (2009) Border Games: Policing the U.S.–Mexico Divide (2nd edition). Ithica, NY: Cornell University Press. BARKAN, S.E., Cohn, S.F. & Whitaker, W.H. (1995) 'Beyond recruitment: predictors of differential participation in a national antihunger organization', Sociological Forum, 10(1) p. 113–134. BELSLEY, D.A., Kuh, E. & Welsch, R.E. (1980) Regression Diagnostics: Identifying Influential Data and Sources of Collinearity. New York: John Wiley. BENFORD, R. & Snow, D. (2000). 'Framing processes and social movements: an overview and assessment', Annual Review of Sociology, 26 p. 611–639. BEYERLEIN, K. & Hipp, J. (2006) 'A two-stage model for a two-stage process: how biographical availability matters for social movement mobilization',	Mobilization: An International Journal, 11(3), p. 219–240. BEYERLEIN, K. & Ward, M. (2007) 'The importance of anger for explaining participation in various types of activism', paper presented at the Annual Meeting of the American Sociological Association. BLEE, K.M. (2002) Inside Organised Racism: Women in the Hate Movement. Berkeley: University of California Press. BLEE, K.M. (1996) Becoming a racist: women in contemporary Ku Klux Klan and neo-Nazi groups', Gender and Society, 10(6), p. 680–702. BLEE, K.M. & Creasap, K.A. (2010) 'Conservative and right-wing movements', Annual Review of Sociology, 36 p. 269–286. BOBO, L. (1983) Whites' opposition to busing: symbolic racism or realistic group conflict', Journal of Personality and Social Psychology, 45 p. 1196–1210. BORJAS, G.J. (1999) Heaven's Door: Immigration Policy and the American Economy. Princeton, NJ: Princeton University Press. BRICK, J.M., Martin, D., Warren, P. & Wivagg, J. (2003) 'Increased efforts in RDD surveys', paper presented at the Annual Meeting of the American Association for Public Opinion Research, Nashville, TN. BROWN, R. (1975) Strain of Violence. New York: Oxford Univ. Press. CARTER, K. (2007) Minuteman Map, Retrieved on-line 2 June 2010, [http://www.vdare.com/articles/announcing-vdarecoms-minutemen-map]. CENTER FOR NEW COMMUNITY. (2012) Profile: Minuteman Civil Defense Corps (MCDC), [Retrieved on-line 11 Dec, 2011, <http://www.newcomm.org/content/view/2102>]. CHAVEZ, L.R. (2008) The Latino Threat: Constructing Immigrants, Citizens, and the Nation. Stanford, CA: Stanford University Press. CITRIN, J., Reingold, B., & Green, D.P. (1990) 'American identity and the politics of ethnic change', Journal of Politics, 52, pp. 1124–1154. CITRIN, J., Green, D.P., Muste, C. & Wong, C. (1997) 'Public opinion toward immigration reform: the role of economic motivations', Journal of Politics, 59, pp. 858–881. COHEN, J. (1985),' Strategy or identity: new theoretical paradigms and contemporary social movements', Social Research, 52, pp. 663–716. CURTIN, R., Presser, S. & Singer, W. (2000) 'The effects of response rate changes on the index of consumer sentiment', The Public Opinion Quarterly, 64(4) p. 413–428. DAVIS, M. (2006) 'Pinkertons, klansmen, and vigilantes', in Justin Chacon, A. & Davis, M. (Eds. ), No One is Illegal: Fighting Racism and State Violence on the U.S.–Mexico Border (p. 15–20 ). Chicago, IL: Haymarket Books. DOTY, R.L. (2007) 'States of exception on the Mexico-U.S. border: security, "decisions" and civilian border patrols', International Political Sociology, 1 p. 113–137. DOTY, R.L. (2009) The Law Into Their Own Hands: Immigration and the Politics of Exceptionalism. Tucson, AZ: The University of Arizona Press. DOVE, A.L. (2010) 'Framing illegal immigration at the U.S.–Mexican border: anti-illegal immigration groups and the importance of place in framing', in Coy, P.C. (Ed. ), Research in Social Movements, Conflicts and Change (Vol. 30, pp. 199–237). Emerald Group Publishing Limited. GILCHRIST, J. & Jerome, C. (2006) Minutemen: The Battle to Secure America's Borders. Los Angeles, CA: World Ahead Publishing, Inc.
GILLIAM, C. (2007) 'Minuteman group grows amid illegal immigration fight', Reuters, 1 November [Retrieved 12 February 2008, <http://www.reuters.com/article/domesticNews/idUSN0142840020071101?feedTy	pe=RSS&feedName=domesticNews&rpc=22&sp=true>]. GOODWIN, J. & Jasper, J.M. (1999) 'Caught in a winding, snarling vine: the structural bias of political process theory', Sociological Forum, 14(1), p. 27–54. GOODWIN, J., Jasper, J.M. & Polletta, F. (2000). 'The return of the repressed: the fall and rise of emotions in social movement theory', Mobilization, 5 p. 65–84. GROVES, R.M. (2006) 'Nonresponse rates and nonresponse bias in household surveys', Public Opinion Quarterly 70(5) p. 646–675. HIGHAM, J. (2006). Strangers in the Land: Patterns of American Nativism, 1860–1925. Newbrunswick, NJ: Rutgers University Press. HOLTHOUSE, D. (2005) 'Arizona showdown', Southern Poverty Law Center Intelligence Report, 118, p. 1–4 [Retrieved on-line 11 December 2011, <http://www.splcenter.org/get-informed/intelligence-report/browse-all-issues/2005/summer/arizona-showdown?page=0,0>]. JASPER, J.M. (1997) The Art of Moral Protest. Chicago: University of Chicago Press. JASPER, J.M. & Young, M. (2007) 'The rhetoric of sociological facts', Sociological Forum, 22(3), p. 270–299. KEETER, S., Miller, C., Kohut, A., Groves, R.M. & Presser, S. (2000) 'Consequences of reducing nonresponse in a national telephone survey', The Public Opinion Quarterly 64 (2) p. 125–148. KELLY, D. (2005). 'Border Watchers Capture Their Prey—The Media', L.A. Times, 5 April. KITTS, J.A. (1999) 'Not in our backyard: solidarity, social networks, and the ecology of environmental mobilization', Sociological Inquiry, 69(4) p. 551–574. KIM, H. (2002) 'Shame, anger, and love in collective action: emotional consequences of suicide protest in South Korea, 1991', Mobilization, 7 p. 159–176. KLANDERMANS, B. & Oegema, D. (1987) 'Potentials, networks, motivations, and barriers: steps towards participation in social movements', American Sociological Review, 52(4) p. 519–531. KLANDERMANS, B. (1997) The Social Psychology of Protest. Cambridge, MA: Blackwell. KOHUT, A. & Suro, R. (2006) No Consensus on Immigration Policy or Proposed Fixes: America's Immigration Quandary, The Pew Research Center for the People and the Press & Pew Hispanic Center. KRIESI H., Saris, W.E. & Wille, A. (1993) 'Mobilization potential for environmental protest', European Sociological Review, 9(2), p. 155–172. LEVINE, R.A. & Campbell, D.T. (1972) Ethnocentrism. New York: Wiley. MASSEY, D., Durand, J. & Malone, N.J. (2002) Beyond Smoke and Mirrors. New York: Russell Sage Foundation. MCADAM, D. (1982) Political Process and the Development of Black Insurgency, 1930–1970. Chicago: University of Chicago Press. MCADAM, D. (1986) 'Recruitment to high-risk activism: the case of Freedom Summer', American Journal of Sociology, 92 p. 64–90. MCADAM, D., Sampson, R.J., Weffer, S. & MacIndoe, H. (2005) 'There will be fighting in the street: the distorting lens of social movement theory', Mobilization: An International Journal, 10 p. 1–18. MCCARTHY, J.D. & Zald, M.N. (1977) 'Resource mobilization and social movements: a partial theory', The American Journal of Sociology, 82 p. 1212–1241. MCLAREN, L.M. (2003) 'Anti-immigrant prejudice in europe: contact, threat perception, and preferences for the exclusion of immigrants', Social Forces, 81(3) p. 909–936. MCVEIGH, R. (1995) 'Social structure, political institutions, and mobilization potential', Social Forces, 74(2) p. 461–485. MCVEIGH, R. (1999) 'Structural incentives for conservative mobilization: power devaluation and the rise of the Ku Klux Klan, 1915–1925', Social Forces, 77(4) p. 1461–1496. MCVEIGH, R. (2001) 'Power devaluation, the Ku Klux Klan, and the Democratic National Convention of 1924', Sociological Forum, 16(1) p. 1–30. MCVEIGH, R. (2009) The Rise of the Ku Klux Klan: Right wing Movements and National Politics. Minneapolis, MN: University of Minnesota Press. MOSER, B. (2003) 'Arizona extremists start anti-immigrant citizen militias', Intelligence Report: Southern Poverty Law Center, 109. MUNSON, Z.W. (2008) The Making of Pro-Life Activists. Chicago, IL: The University of Chicago Press. NAVARRO, A. (2009) The Immigration Crisis: Nativism, Armed Vigilantism, and the Rise of a Countervailing Movement. Lanham, MD: AltaMira Press. NEPSTAD, S.E., & Smith, C. (1999) 'Rethinking recruitment to high-risk/cost activism: the case of Nicaragua Exchange', Mobilization: An International Journal, 4(1) p. 25–40. NUNEZ-NETO, B. (2005) 'Civilian border patrol organizations: an overview and history of the phenomenon', Congressional Research Service, 7 September. OEGEMA, D. & Klandermans, B. (1994) 'Why social movement sympathisers don't participate: erosion and nonconversion of support', American Sociological Review, 59(5) p. 703–722. OLZAK, S. (1992) The Dynamics of Ethnic Competition and Conflict. Stanford, CA: Stanford University Press. OLIVER, P. (1984). 'If you don't do it, nobody else will: active and token contributors to local collective action', American Sociological Review, 49(5) p. 601–610. PASSY, F. & Giugni, M. (2001) 'Social networks and individual perceptions: explaining differential participation in social movements', Sociological Forum, 16(1) p. 123–153. PRITCHETT, L. (2006) Let Their People Come: Breaking the Gridlock on Global Labor Mobility. Washington DC: Center for Global Development. RIDGEWAY, C.L. (1997) 'Interaction and the conservation of gender inequality: considering employment', American Sociological Review, 62 p. 218–235. ROTHMAN, E.S. & Espenshade, T.J. (1992) 'Fiscal impacts of immigration to the United States', Population Index, 58(3) p. 381–415. ROSENSTEIN, J. (2008) 'Individual threat, group threat, and racial policy: exploring the relationship between threat and racial attitudes', Social Science Research, 37 p. 1130–1146. SANCHEZ, R. & Pita, B. (2006) 'Theses on the Latino bloc', Aztlan: A Journal of Chicano Studies, 31(2) p. 25–53. SHAPIRA, H. (2013) Waiting for Jose: The Minutemen's Pursuit of America. Princeton, NJ: Princeton University Press. SKOCPOL, T. & Williamson, V. (2012) The Tea Party and the Remaking of Republican Conservatism. Oxford: Oxford University Press. SMITH, J.P. & Edmonston, B. (1997) The New Americans: Economic, Demographic, and Fiscal Effects of Immigration. Washington: National Academies Press. SMITH, T.W. 2003. A Review of Methods to Estimate the Status of Cases with Unknown Eligibility. Report prepared for the AAPOR Standard Definitions Committee Presented to AAPOR, Phoenix, May. SNOW, D.A. (2006) 'Are there really awkward movements or only awkward research relationships? ', Mobilization: An International Journal, 11(4) p. 495–500. SNOW, D.A., Rochford, E.B., Worden, S.K. & Benford, R.D. (1986) 'Frame alignment processes, micromobilization, and movement participation', American Sociological Review, 51(4) p. 464–481. THE SOUTHERN POVERTY LAW CENTER (2011) '"Nativist Extremist" groups 2010', The Southern Poverty Law Center Intelligence Report, 141. WALSH, E.J. & Warland, R.H. (1983) 'Social movement involvement in the wake of a nuclear accident: activists and free riders in the TMI area', American Sociological Review, 48 p. 764–780. WARD, M. (2013) 'They say bad things come in threes: how economic, political and cultural shifts facilitated contemporary anti-immigration activism in the United States', Journal of Historical Sociology, [doi://dx.doi.org/10.111/johs.12024]. WILTFANG, G.L. & McAdam, D. (1991) 'The costs and risks of social activism: a study of sanctuary movement activism', Social Forces, 69(4) p. 987–1010.